How do you primarily use The Wind Roses? I don't ever play with or don't own The Wind Roses. This week's element is THE WIND ROSES. Introduced by Hans im Glück as the first of their Carcassonne-on-Tour promotional expansions, this six-tile extension did not enthuse too many people then or now. Its rules are simple, hence its lack of interest. An orange compass rose replaces the start tile and divides the board into four geographic quadrants. When a player pulls one of the four tiles that depicts one of those quadrants (NW, NE, SW, SE) and places it within the quadrant, they earn three points. Nothing needs to be claimed and the tile serves no other purpose. 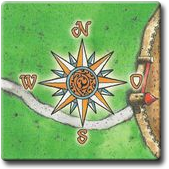 A sixth tile, a blue compass rose, can also be drawn and placed on the board, thereby re-quartering the board according to the new compass. That's it. The expansion does no more than potentially grant 12 bonus points throughout the course of a game. The sheer lack of alternate purposes and the small scale of the bonus points demonstrates the promotional nature of this expansion. It contributes very little to the game and the fact that the initial rose is replaced with another random one later on kind of defeats the visual purpose of the wind rose, which places a compass on the board like it is a map. There is little strategy to this and later Carcassonne-on-Tour expansions certain accomplished more using the same amount of tiles. Discuss your relationship with The Wind Roses and how you optimise your use of this strategic element. I played a game or two with them on JCZ and that proved to me, that I would not be interested in buying the actual tiles. The "theme" seems very artificial to me, similar to the "Wheel of Fortune" and I agree with you: there is little strategy in it and the points are marginal. What are the later expansions from "Carcasonne on Tour"? Nice idea but not practical for a game with several expansions thrown in. I voted for the first choice. After many plays we took the tiles out of our game. They were somewhat cumbersome to keep track of for so few points. They ended up just being used as normal tiles. Finally we took the tiles out to shorten our mega game a bit. I would bring them out with a vanilla game or with very few expansions. What are the later expansions from "Carcasonne on Tour"? Looking at those, we're not at the equivalent of 24 tiles (since German Castles are double-width). That's pretty much a large expansion. Yay! I'm now curious to try all three together. The Wind Roses were origninally published in 2012 at the exhibition "modell-hobby-spiel" in Leipzig. Udo Schmitz started the Carcassonne-on-Tour with the Wind Roses. The visitors at the exhibition have to play Geo-Cashing to get the Wind Roses. The mini was then a part of Carcassonne-on-Tour for around a year. The Wind Roses became available in the CundCo-Shop at Spiel 2013 in Essen. And the Wind Roses II (with 2 directions N, S) became available in the Spielbox. I chose "some other creatively strategic manner" because we only ever play Wind Roses with house rule variants. We've tried a couple of different things but none of them have been really intriguing. I'm fairly neutral on the Wind Roses. I have serious issues with this expansion. I love it because I have a huge affinity for anything related to compasses. I love the addition of cardinal points to the Carcassonne 'map.' I would love to make this a regular expansion. Unfortunately, despite all that, the rules for this expansion are (to be delicate about it) rubbish. Three points for a dictated tile placement? I rarely see players bother, most will just place the tile where they like. If I play with this expansion I almost always use a house rule. I've tried a few variations, and have detailed the one I use the most in thread linked below. These are some of my favourite tiles, it's just a shame about the rules. Is this the only expansion that allows a player to gain points without using a meeple? Almost except: Traders and Builders & King & The Robber Baron award points to the player who completes: a city for goods, longest road and longest city. Not for scoring those features. Fair enough, but those 2 expansions are offering possible points at the end of the game rather than definite points when played. I. a Trader tile is the last tile played in a game and it completes a city and gives the active player a majority (or equal majority) in one of the trade goods in that city. II. any final tile that is played which completes either the longest road or largest city where the King or Robber Baron are in play. For those interested, I've suggested some rules to make the wind rose tiles worth playing, in a proposed variant I'm calling True North. Whaleyland has provided a nice, substantial commentary/critique, and I've responded with my agreements and rebuttals. You can join the discussion here. The Wind Roses - how to get the prize?